As 2014 draws to a close here in the next hour, I took some time to choose my personal favorites this year. A lot of great things happened for me this year and I am very happy to share some of them with you all. Without the support of such a wonderful family, none of what I do would be possible. My son Joshua recently turned 10. DOUBLE DIGITS = SERIOUS BUSINESS. I gave him a used Fuji X20 as he is super-excited about learning the art of photography with dad. My daughter Talia turns 8 in two days. 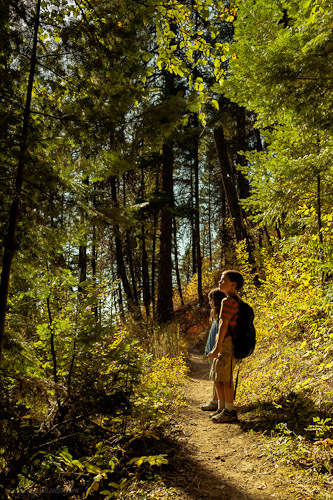 Both she and Joshua LOVE to go hiking and look forward to our adventures. 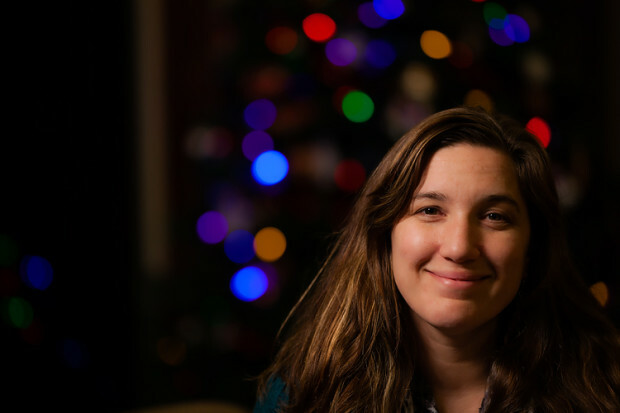 My amazing wife Amber has been my wonderful companion now for fifteen years and has a birthday in……well…an hour and fifteen minutes from now. Happy Birthday baby! To start off the year, I took a quick three day trip up the Crowsnest Highway in Canada just to do some exploring and made the below image of me walking down the black-as-night road with the Milky Way rising above the fog bank. 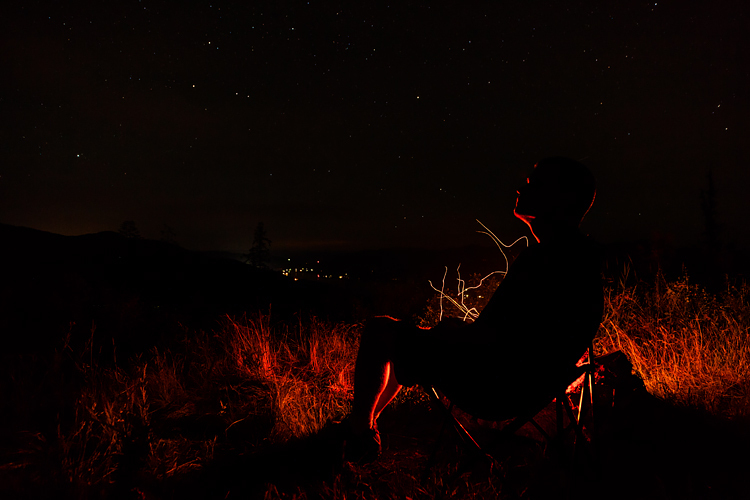 Later in the spring, I was experimenting around with using a campfire as rim lighting and made this image below from our campsite on one of the hills surrounding Priest River, Idaho. In June, I served as the DP for Scott Gardenhour’s short film, “The River”, shot in Priest River, Idaho, a film intended to help revitalize and rediscover small-town America. The two images below are some of the stills I photographed that went into the production (reproduced here with permission). 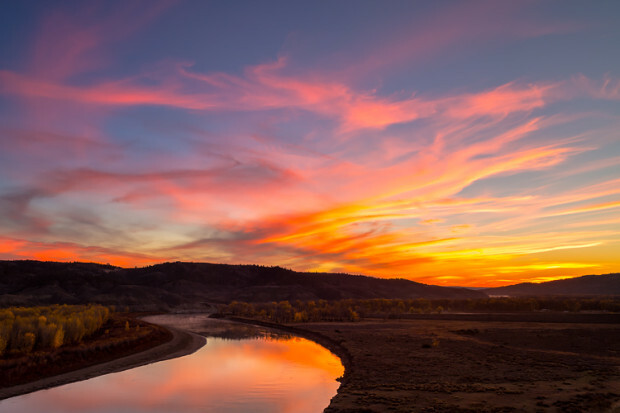 In the fall, I made a trip back to Central Montana toward the Missouri breaks area and made my personal favorite of the year below. 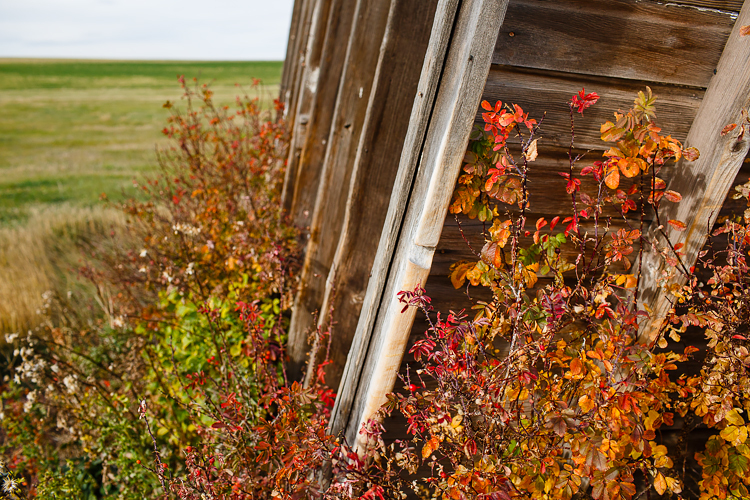 Central Montana has a lot of hidden treasures. As many of you know, I have a special fondness for old structures that are being reclaimed by the elements. This last trip was very fruitful and I also captured these two images below. 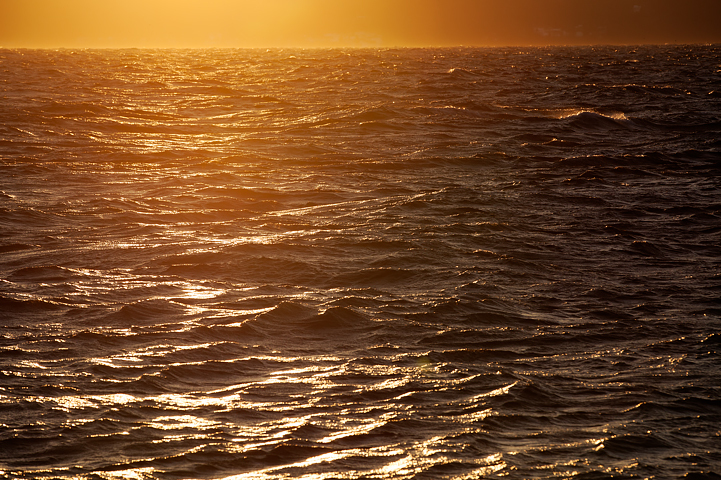 Finally, I made this image of the waters at sunset along Admiralty Inlet from the shore of Bush Point in Whidbey Island, Washington – one of my favorite places in the world to be! If my work brings a little bit of joy into someone’s life, then I have succeeded. Here’s to 2015 and all of the good things that will come! Happy New Year! 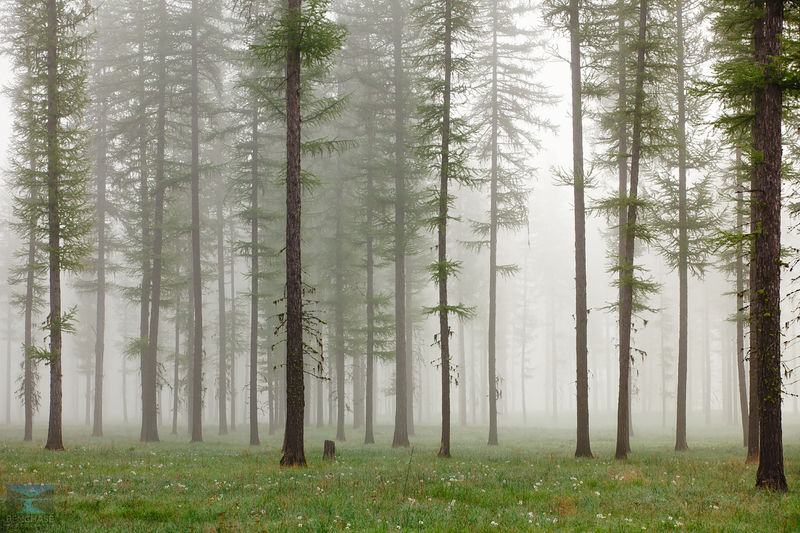 The fog-enshrouded trees creates an eerie scene in the early morning. The addition of fog transforms what might normally be a simple stand of trees along the highway into another world entirely. I feel compelled to write a response to what some fellow photographers are saying about infringement. I respect many of these guys and gals, so please don’t take what I am saying as any kind of criticism about their work. David duChemin recently posted an article entitled “Let them Steal” that I find myself having mixed feelings about after reading through it. I very much agree with most of what David is saying. What I don’t like is the “Let Them Steal” part. One of the facts of life as a photographer dictates that the higher of a profile you get online, the more instances of companies and people will start using your work without permission. There are a lot of reasons why people do this. Some simply are ignorant of the laws in place to protect artists’ work. Some feel that anything posted online should be free for all uses without exception. There are also others that know what they are doing is wrong and do it anyway. What I’m asking for is this: Give us the chance to say yes or no to as to where it’s being used. Photography is a very time consuming, painstaking, and expensive effort. We spend thousands upon thousands of dollars to capture these moments and share them with the world, please have enough respect to allow us to say yes or no about where we want our work displayed online, and please don’t be offended if we ask for compensation after we understand how it is going to be used. 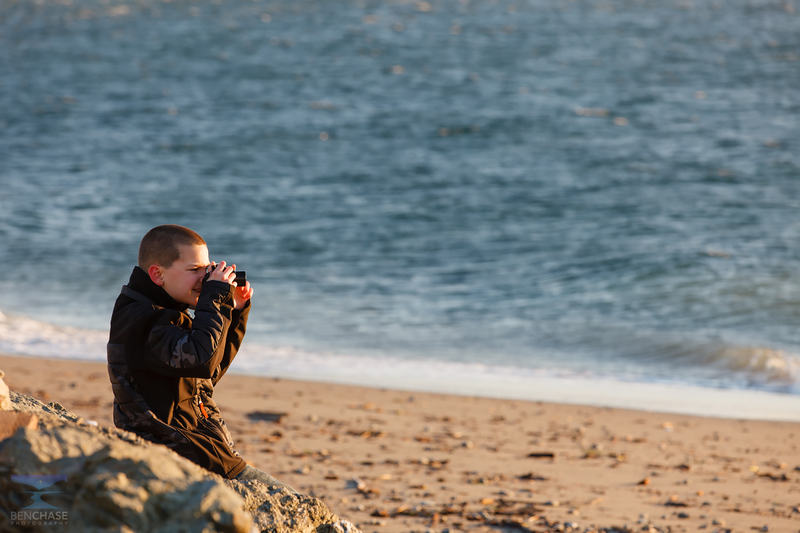 Fellow photographers – that goes for us too. Using music that isn’t licensed or software that you didn’t pay for makes you into a hypocrite. Do the right thing. October in the Washington Cascades. If you’ve spent time there while the larches are turning yellow and the weather starts to take on a slight chill, then you know just how special this place is. I’d like to share with you all some select images from this trip – I hope you enjoy them! Please join my friend Don Pratt of Focal Length Productions and I for a field review of Gerbing’s heated outdoor wear. 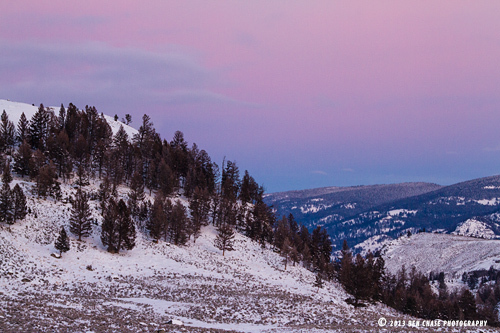 Evening pastels fill the sky in Yellowstone National Park, Wyoming. With a lifetime full of backpacking, hiking, and other adventure travel, I feel comfortable in saying I’ve used quite a few different types of outdoor clothing. Down vests, parkas, shells, fleece, Capilene, Smartwool, etc – I’ve tried many different brands/types and have at least one of them I use regularly. 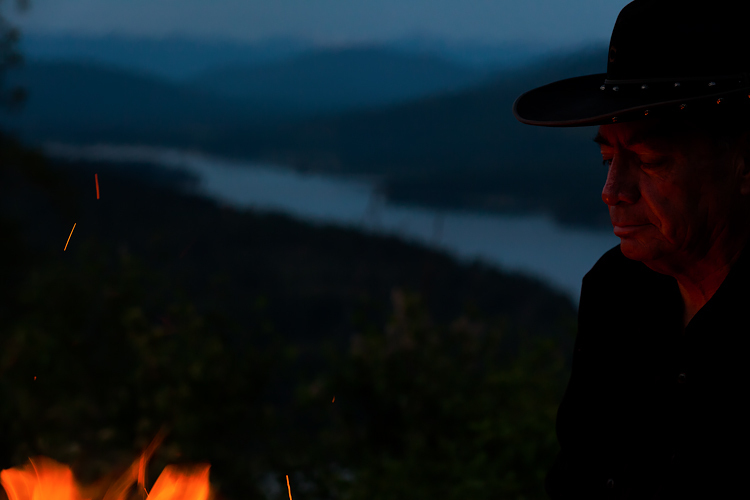 Don’s adventures are similar, and include snowmobiling, motorcycling, and hunting. Through all of these experiences, we know cold weather pretty well. Enter Gerbing’s electronically-heated outdoor gear. If you’re like us, the notion of “electronic heating” combined with outdoor wear probably brings a skeptical expression to your face. “Battery-heated clothes? How exactly would that hold up to the elements?” It turns out – pretty darn well. Sit back for a few minutes and we’ll tell you just how well it actually did work. 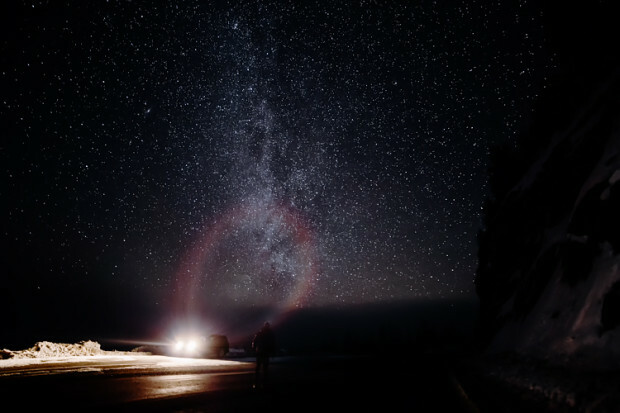 The test scenario was the following: A 4-day scouting trip on Yellowstone’s north road, the only one open in the winter which included some short hiking up snow-covered roads and cross-country skiing. Weather was variable with light snowfall and medium-force winds. Temperatures varied from close to -10F to about 12F. Fairly mild to typical Yellowstone winter weather. I normally wear either a down vest or an Eddie Bauer down jacket, depending on the level of misery being experienced at the time. Don generally opts for layers of thermals, fleece and Thinsulate. Chemical hand-warmers are the norm for both of us. For this particular trip, Gerbing was kind enough to offer the use of their electric vest liners, electric gloves, and each type of battery in the product line so that we could experience the CoreHeat difference. The smaller BAT-LI-722R batteries are generally designed for their gloves (and come with both the gloves and vest liner); the mid-size BAT-LI-7CHCD battery can power jackets, vests, and seat cushions; and the huge BAT-LI-128MVKT lithium battery is designed for large devices, such as heated golf cart seat cushions, stadium seats and the like. This bad boy of batteries also has a USB port for charging things like your phone, tablet, or a Prius. As a working photographer, one complaint I always have in the winter are that my hands are pretty much always uncomfortable outside. Setting up a tripod and operating the camera is difficult and sometimes just not feasible with most types of gloves out there, which has necessitated the glove off > adjust camera > glove on scenario. Holding grad filters? Yeah, it gets even more miserable. Enter Gerbing’s heated gloves. While the gloves are a bit stiff and aren’t miracle working when it comes to being able to operate the camera with them on, the sheer beauty of these gloves for me came from being able to stick my hands back into a warm set of gloves after making adjustments to the camera. It makes hand warmers in pockets look like stone-age technology. These provide an instant-warm up to my fingers which honestly brought a smile to my face! The only downside was the extremely bright red LED’s on the batteries. This can be solved by turning the battery around in the battery storage pocket of each glove, but then you cannot access the power/level button. Perhaps a time-out of the LED display would be a good future innovation. For Don, the major grumble is waiting for those first vestiges of perfect light in the pre-dawn hours, standing in a frozen wasteland for hour long stretches. Coffee and shivering only produce so much heat. We have used a Jet-Boil for years to provide us with hot bellies, but even that doesn’t cut the chill after a while. 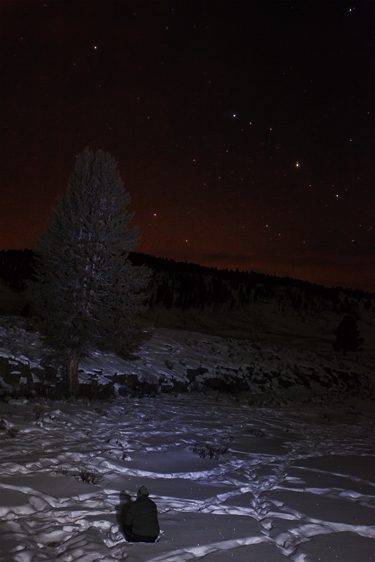 A photographer sits midst bison tracks under a clear night under the stars. For this, Gerbing makes the heated vest liner, part number VTCHLN. The advertising copy claims a heat output of 135F on the highest setting, and that seems to be about right. This is not something you want on your bare skin, but having it over a base layer worked perfectly. With the stock small battery, we were able to run the vest on high for around an hour and a half. Step up to the mid-size battery, and it goes to 3 hours. Strap up the big guns, and you get 10 hours of heat. Both the mid-size and large batteries come with a convenient Chevy-style key fob to control the heat output, with audible feedback from the battery to let you know what heat level you are at. The vest liner has heat panels right about where a breast pocket would be on either side, and a large panel crossing the shoulders. We had expected a kidney heater, but that was not the case. If this is something you want, you could consider the heated back wrap (BWCH). Charging the batteries was fairly painless, Gerbing offers both 120V and 12V chargers, with multiple plugs to allow charging of more than one battery. Overall, we rate the product as a must-have for extreme cold weather trips. If you are just going out for a day, and will be close to your vehicle, the cost is somewhat prohibitive (prices can be found at www.coreheat.net). If you are going to spend several days on a trip, with multiple hour exposures (pun intended), get some electric gear. 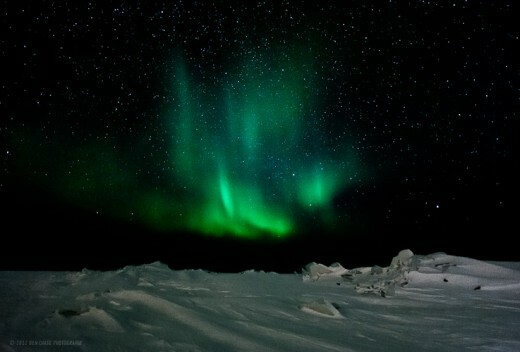 This would have been a great addition on our Yellowknife trip, and will be a no-brainer for future winter expeditions. Today, Petapixel featured a story concerning the somewhat muted controversy about National Geographic choosing an image of a tiger taken in a zoo for the winner of the “Nature” category. In the Twitterverse and elsewhere, opinions have ranged from white-hot fury, to an understanding of why the image was chosen. Bravo to the winner for honestly including all of the details of the capture. I’m going to be upfront and say that while I think the photo itself is truly outstanding, I think choosing it as the winner of the Nature category is dead wrong. Why? First, there needs to be a distinction between a photograph of wildlife in its natural element versus a photograph of animals in captivity. The story is important. If the story ceases being important and we choose to not distinguish what is happening in the wilderness versus what is happening in a game farm or zoo, then we have taken all of the magic out of nature and landscape photography as a whole. This may sound ridiculous to some, but when I look at an outstanding wildlife image and see that it was captured under controlled conditions in a zoo, it takes the impact away from me almost immediately. While it still remains a great photograph, it doesn’t rise to what it would have been had it been captured under natural conditions. In my opinion, the intangible experience of the capture absolutely matters in the final product. To say that 2012 was my best year ever would be an understatement! The pursuit of exploration and adventure has taken me to places I had never thought I’d be. I’m left wondering, what will 2013 bring? In January, my good friend Don and I went to the Northwest Territories on a 10-day, 3500-mile road trip. You can read my feature article about that trip in the Dec/Jan issue of Photolife magazine. The first image you see below was made the night of my birthday, January 19th standing on the frozen Great Slave Lake, probably about a mile or so out on the ice in the most miserable conditions I have ever experienced outdoors. Bursts of greenish-blue color from the Northern Lights illuminate the night sky above the Great Slave Lake in Northwest Territories. The image below was made as the moon was rising to the left of the frame, illuminating the landscape while stars were still visible. This was about a 10-minute single exposure (not stacked) on the Alvord Desert in Southeast Oregon. 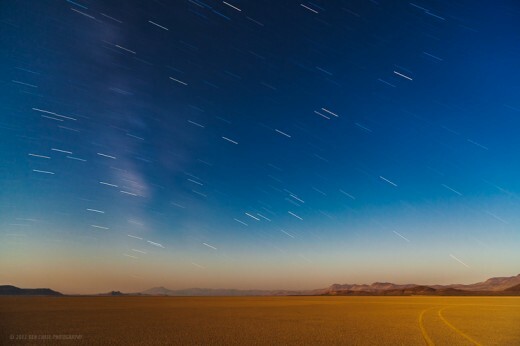 The stars and Milky Way galaxy are seen above curving tracks in the desert playa in the Alvord Desert, Southeast Oregon. The lovely sunrise you see below was made on a trail in the North Cascades near Wing and Lewis Lake. There is an interesting story on this trip which I will be sharing in a future post which some may find amusing! 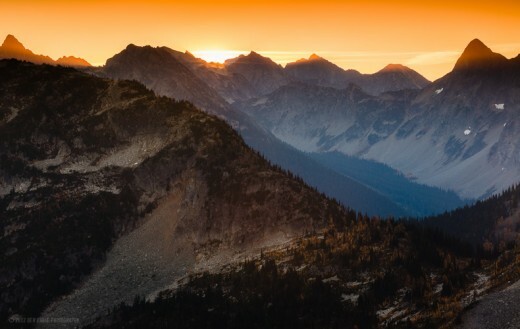 The sun slowly creeps over the horizon as seen from a trail in the North Cascades of Washington State. This homestead image is near and dear to my heart for several reasons. First, it was a friend of mine’s first trip with me on a photography expedition, and second, we found this 100% by luck while exploring the Cascade County area of Central Montana. 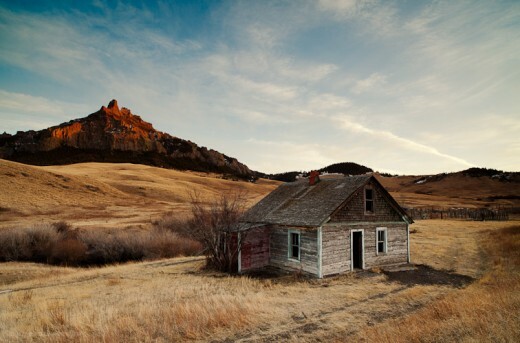 An abandoned homestead in Cascade County, Montana is seen near sunset with a warmly-lit mountain in the background. I call the one below, “Storybook Lane”, and I’m not sure why. As I was driving up the Fields-Denio road in Southeast Oregon, I saw this tree and fence next to the road with Steens Mountain in the background and was compelled to get out and look around to compose a shot. As I was selecting the focus, a Golden Eagle flew into the frame and I waited for a split second for him to open his wings before I clicked the shutter. It was like he intended to be in the shot! Even if no one else ends up enjoying this shot, it will forever be one of my all-time favorites, just because of the experience! 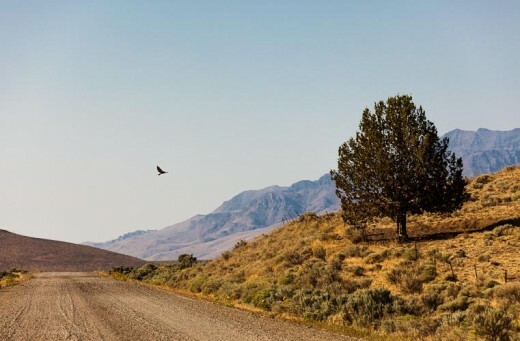 A golden eagle soars above a pastoral scene in Southeast Oregon along the gravel Fields-Denio Road. 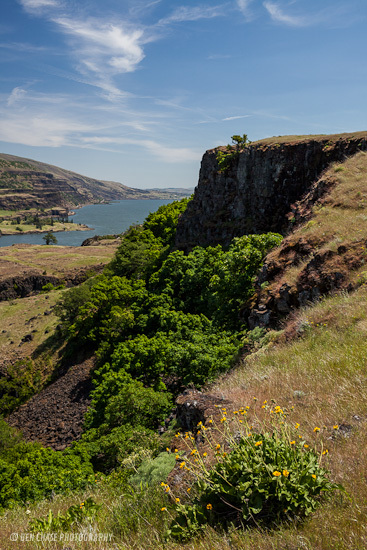 During springtime, I made a trip over to the Columbia River Gorge area, spending probably an equal amount of time on both the Washington side as well as the Oregon side. 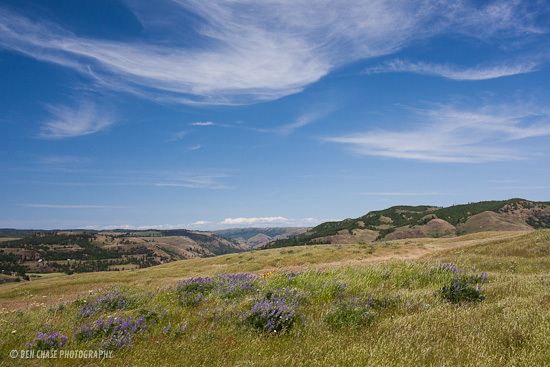 This was taken on the Oregon side, not far from the Rowena area while the Balsamroot was in bloom. 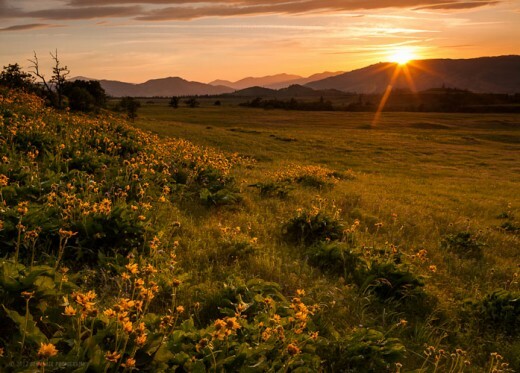 The sun descends behind the hills, casting its warm light among a grassy hillside covered in balsamroot flowers along the Columbia River Gorge in Oregon. One thing I promised myself I would do this year is to make images that many would feel simply wouldn’t be possible. I had more than one person tell me that trying to take pictures of horses under starlight just wouldn’t work. In some cases, motion blur is totally natural and expected, this being one of those times. I waited for about a one-half to three-quarter moon and then drove into Montana toward Cascade County to make this as well as other shots under starlight. 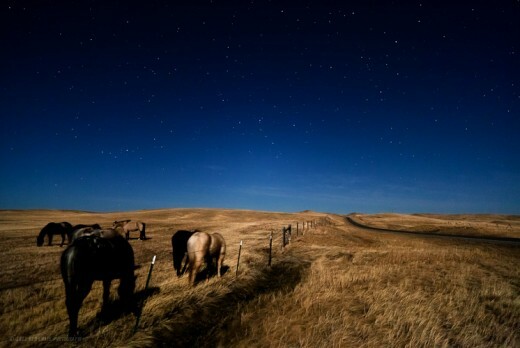 Seven horses gather along a barbed-wire fence in Central Montana under the light of a full moon with a highway stretching off into the distance. The Maligne Lake Road in Jasper National Park is well-known for spotting wildlife at any time of year. A light snow was falling and I caught this young moose creeping out of the forest through the snow in search of food. I felt that a black and white conversion with some toning would really bring out the contrast of the snowflakes against the dark fur of the moose. 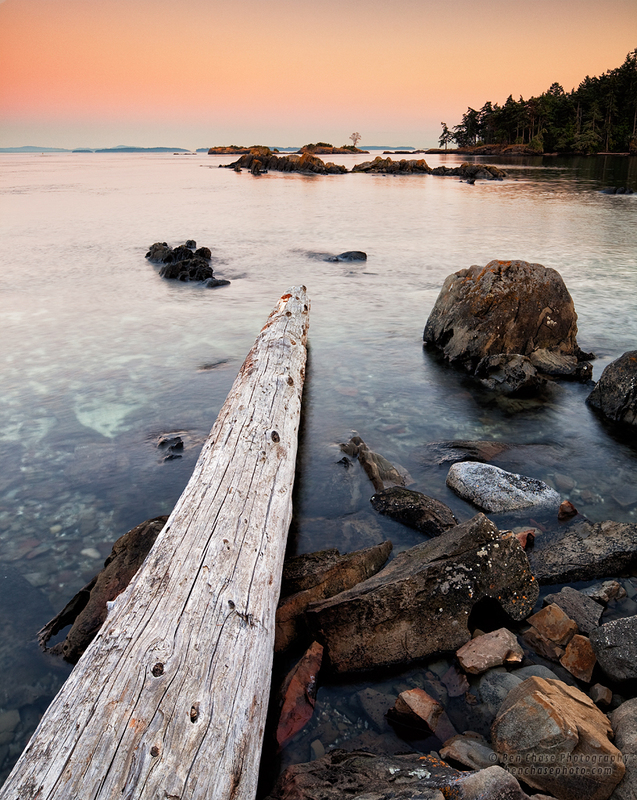 This looks fantastic on canvas as I just had a 36×24 made. 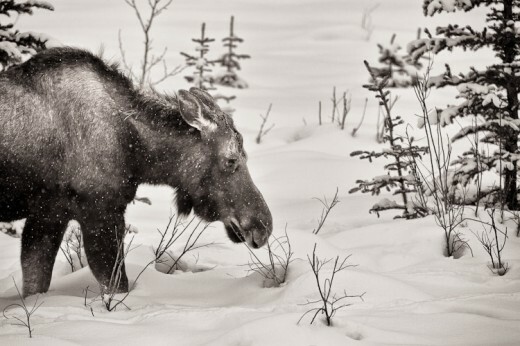 A young moose stands in the snow among the trees in winter. This tang-colored guy was also spotted on the Maligne Lake Road in Jasper. As with nearly all red foxes I have been in contact with, this one was pretty indifferent to my presence. He went about his way, digging in the snow and listening for rodents tunneling. As crazy as it sounds, I’d love to have a domesticated red fox as a pet! My wife isn’t exactly on board with this idea unfortunately, so we’ll just have to make due with our German Shepherd. It’s just, that I read that a companion could help protect your dog from loneliness and all the problems that follow that. 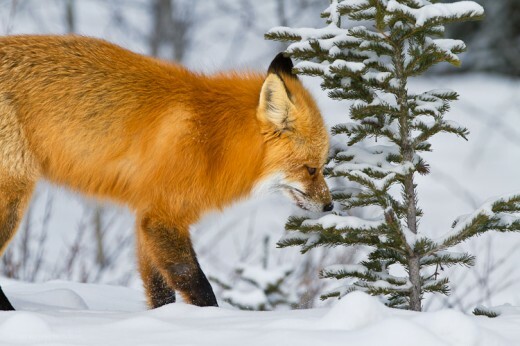 A red fox digs in the snow near a small tree in Jasper National Park near the treeline. This year I started taking my son and daughter on short day trips to begin to help them learn some skills and get some experience in the outdoors. 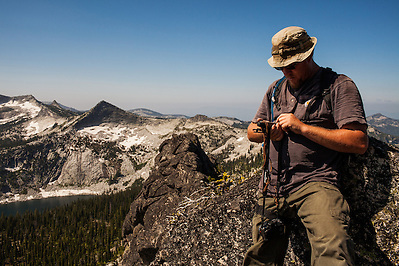 A side benefit is the ability to shoot some outdoor lifestyle pictures of them as a part of it! My son looked up in this tree toward a noise right as the sunlight peeked through the branches, creating a very nice rim-lighting situation that I saw immediately. 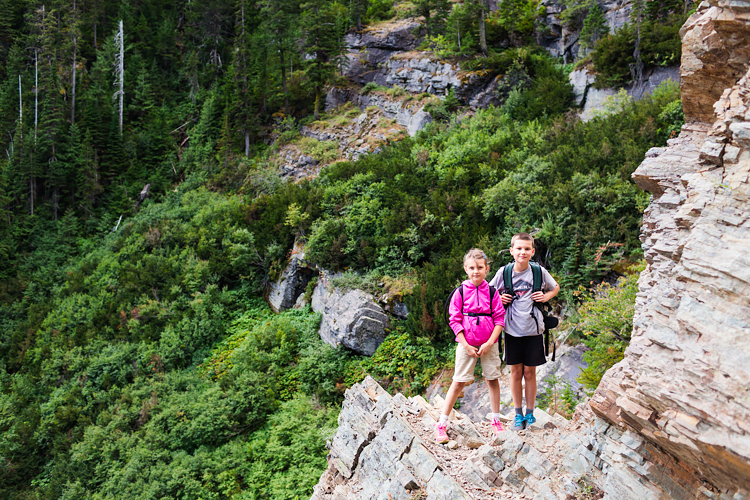 A young boy and his sister hike in North Idaho. I look forward to 2013 with excitement, and I am already making plans for a trip into Yoho National Park, Kootenay Flats, and surrounding areas next week! Thank you for taking the time to look at my selections this year, and please stay tuned by subscribing to my newsletter! I believe there is something different about photographing areas that are sparsely populated or generally devoid of people. Isolation helps to clear my mind. The experience of photography as a whole is much more meaningful to me if I’m not totally surrounded by technology or civilization. These days, I’m seeking out places where it’s expected to see less people. 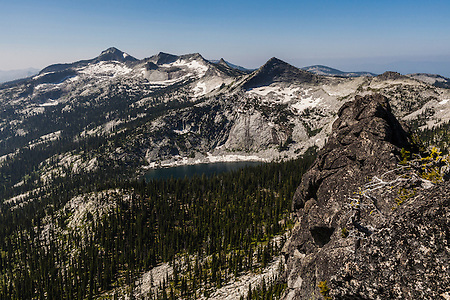 Southeast Oregon is such a place, but isolation does not come without a few concessions. Consider that Oregon does not permit pumping one’s own fuel and stations often close early in the evening. Also, there may be 50-100 miles between fuel stations in a few areas so you can see that being isolated in this area requires some forethought and planning. 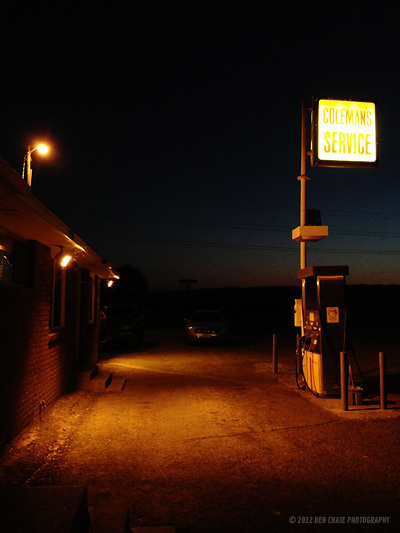 A dimly-lit sign illuminates a remote gas station in Southeast Oregon. 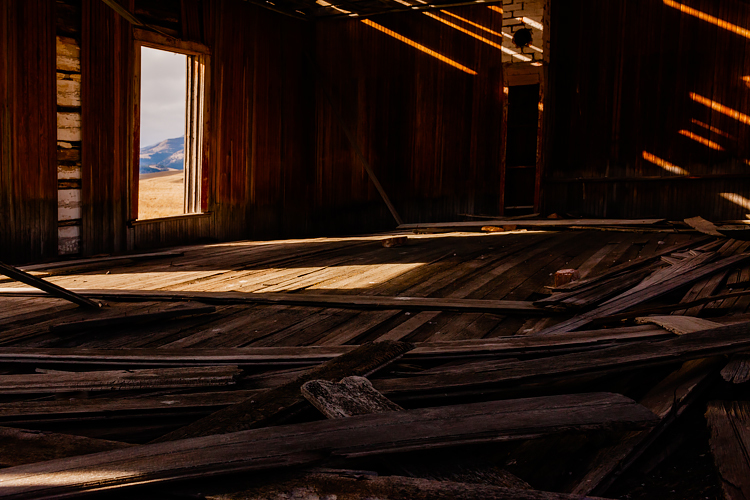 Harney and Malheur County are true gems that show just how much beauty Oregon contains within its borders. I’m pleased to share the “Beauty of Southeast Oregon” gallery and hope that some of you will experience the uniqueness that this place has to offer. Cattle ranching is one of the major occupations here and this is one of the few places you can still see legitimate cattle drives coming down the road. 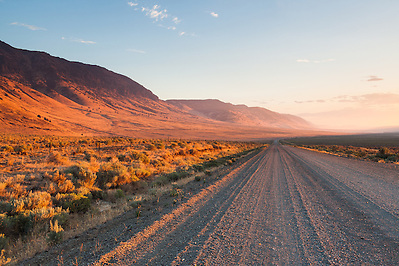 The Fields-Denio road is a long stretch of gravel road that parallels Steens Mountain on one side and the Alvord Desert on the other. You can’t really go wrong when it comes to deciding where to explore here. On the Steens side, you have a multitude of canyons and views at altitude. On the Alvord side you have the hot springs and the desert playa itself where you can find everything from people speeding across the desert in their land sailers, to people finding a nice quiet spot for some overland camping. Great people, great scenes, and a great experience. I look forward to what visual candy this area will bring in Winter. It’s becoming more and more difficult to find true solitude in the backcountry today, requiring more of a trek to reach places devoid of people. Living in a sparsely-populated area in North Idaho, you would think that I would know the area I live in “like the back of my hand”, but the truth is, I’m guilty of not spending a lot of time in my area, preferring to travel to locations such as Montana, Wyoming, Oregon, or up North to a variety of beautiful locations in Canada. This year, I decided to spend a little more time exploring the area where I live. After some quick research on summitpost.com, I decided to head up to Harrison Peak with my friend. 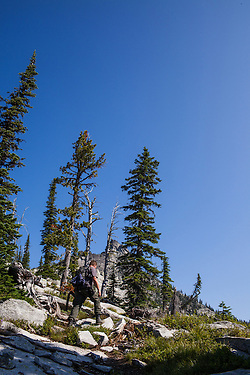 While not a difficult hike, there is some steep cross-country hiking to the peak after you reach the lake. This leads to a boulder field that I would recommend spending some time traversing to the eastern side instead of ascending on the western side, unless you intend a more technical climb. Routefinding is not terribly difficult here given the visibility that you have once you’re near the ridgeline that leads to the summit. With the tufts of cotton-like fur stuck to the small tree branches, I was half expecting to be greeted by some friendly mountain goats, but unfortunately there were none. We didn’t summit the peak due to the fact the approach we made would have forced us to make a fairly technical ascent which we were not properly prepared for. That being said, the views certainly did not disappoint from this height! It was a beautiful clear day, albeit a bit windy at the top. M spent some time putting waypoints into his GPS before we started back down toward the trailhead. I was fairly convinced this was going to be a good place to explore without seeing a lot of other people as the trailhead is at the end of a fairly rough road. While it wasn’t entirely devoid of people, we only encountered a few people on the way up (mostly at Harrison Lake), but on the way down I was shocked to find the trailhead surrounded by cars as well as a bunch of people heading up. I guess everyone had the same idea we did that day. See the entire gallery here. Today I’d like to talk about something that I believe is very important in landscape photography. “What’s that?” You ask? Simple. Sky drama. 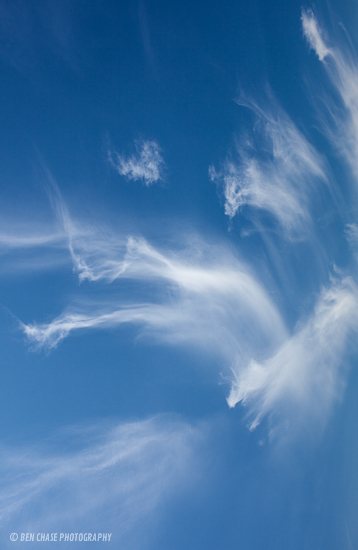 Naturally-occurring animal shapes in clouds adds a touch of drama to the sky. I can assure you there are no “shenanigans” in the above photograph. I’ve seen some pretty awesome clouds before, but never clouds that look like ghostly, ethereal animals materializing out of the water vapor! 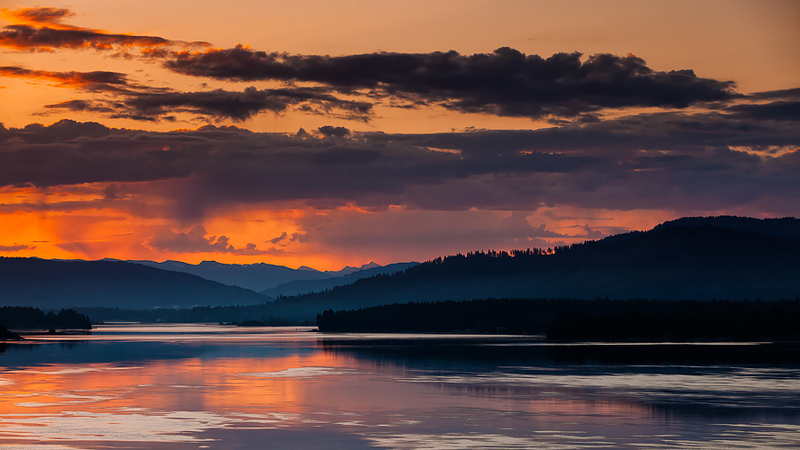 Clouds can often add the finishing touch to what would normally be an ordinary photograph. A few weeks ago, I made a trip to the Columbia River Gorge area bordering Washington and Oregon with the purpose of capturing wildflowers and the surrounding landscape.On this one particular day while I was in the gorge, I came across so many different varieties of interesting clouds in a short time that I could hardly believe it. Mare's tails dance across the sky in the Columbia River Gorge. All of the images in this post were taken within a 24 hour period. If only most spring and summer days could be like this! Out of all types of clouds, I would have to say that either Mare’s Tails or Nacreous (Mother of Pearl) clouds are probably my favorite. Nacreous clouds are pretty rare, but Mare’s tails occur fairly often and have produced some of my favorite landscape images. 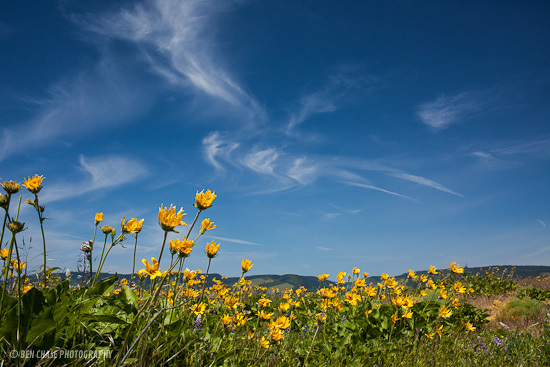 Yellow balsamroot flowers are seen on a bright sunny day with swirly white clouds. While this image of yellow balsamroot flowers would probably look good with just a blue sky, I believe the patterns in the clouds give it a finishing touch that works well. I was lying on some rocks near these flowers so not to disturb them, but I have to admit I was very tempted to take a nap at this location. The wind in the gorge area can be incredibly fierce, but fortunately we have modern DSLR sensors like the Canon 5D Mark II & 5D Mark III that perform well at higher ISO values, allowing faster shutter speeds. 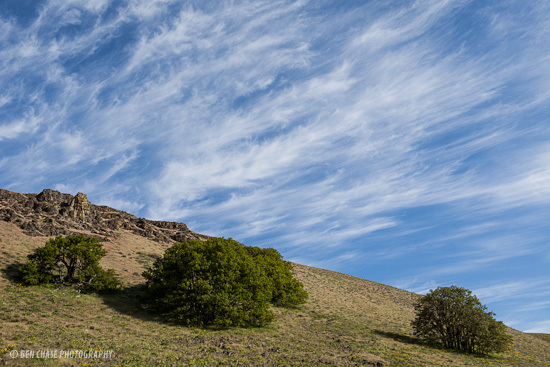 White feathery clouds decorate the sky above the Columbia Gorge on the Washington and Oregon Border. I can only imagine seeing this landscape back before it was settled by non-natives, or being a member of the Lewis & Clark expedition into the West. I have to imagine the members of the expedition were speechless upon seeing these lands for the first time. How would you tell others what you saw upon your return home? You can only write so many words for what one has to see with their own eyes. Green foliage surrounds a cliff side at the Columbia River Gorge area. Stay tuned for more upcoming work from the Columbia River Gorge area in the next week! I offer three styles of prints for those who enjoy decorating their home or office with landscapes from the Northwest U.S. and Canada. I can help you select artwork that matches a specific color palette to brighten up your space or a variety of black and white fine art to create the right atmosphere!